moving to Washington, DC working for a Satellite TV competitor of CNN then to Atlanta where her career flourished at Fox affiliate. She will be remembered as a trailblazer and inspiration to countless journalists. Ms Davis was engaged for eight years. That relationship ended leaving her to struggled with substance abuse. Eventually a DUI charge would contribute to early retirement in 2012. Knowing the youth driven market competition, Amanda made a comeback based on her belief in purpose as a journalist. She was a mother of Melora Rivera, actress and writer. When a woman dies suddenly of a stroke at age 62, it begs to inquire, why? Amanda was a dedicated career journalist her whole life. Not finished in 2012, she made a come back in 2014 though she stumbled again, entered rehab, and developed a special at CBS about ‘alcoholism’ that included her story. Her career spanned from 1979 to 2017. What is the cause of a stroke and does alcoholism contribute? According to WebMD.com ‘Too much alcohol in middle age can increase your stroke risk as much as high blood pressure or diabetes,…’ Amanda had rebounded her career solidly as working with a local CBS affiliate. She faced a holiday season, after the recent death of her biological father in early December, her mother had recently recovered from pneumonia in November and now news on the loss of her stepfather ‘Pop’. Amanda was traveling to the funeral when she collapsed in the Hartsfield-Jackson Atlanta International Airport and was taken to the hospital and died a day later on December 27, 2017. The events during 2017 and particularly during the holiday season can take a toll in unknown ways. 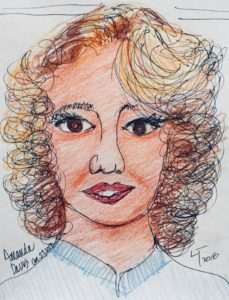 Amanda Davis will be remembered for her successful career as a journalist, her dark DUI record due to alcoholism, and her professional comeback only to suffer a sudden tragic death from a stroke. She teaches us to keep overcoming our frailties, continue striving, and to watch your health. She found purpose and achievements in her career where fewer women especially those of color were in the TV News media field. Her legacy will benefit those who came behind her, as a pioneer in programming working decades as a successful newscaster in the Atlanta television market. We salute Amanda Davis as our ‘Global Afro Woman Protagonist’ and pray for her family during this deeply heartfelt time in their lives.